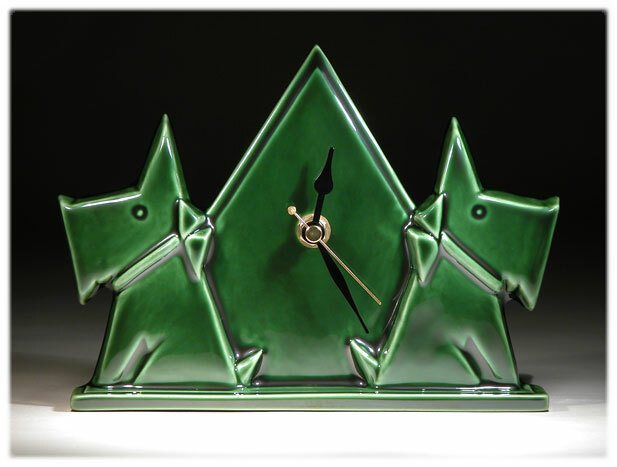 The inspiration for this attractive, geometric Mantle Clock comes from combining matching Art Deco lines with the characteristic and much loveable features of the little Scottie Dog. On this timepiece the Scotties are shown as attentive and dutiful mantlepiece watchdogs. During the 1920's and 30's wonderful Art Deco style animals were often used as architectural detail, being incorporated into the design of buildings in clever and meaningful ways. The Scottie forms part of Echo of Deco's ever growing collection of stylised animals appropriately called 'Ark Deco'. This particular piece has been finished in Echo Of Deco's own Racing Green glaze, but is also available in many of the studio's other unique glaze colours.